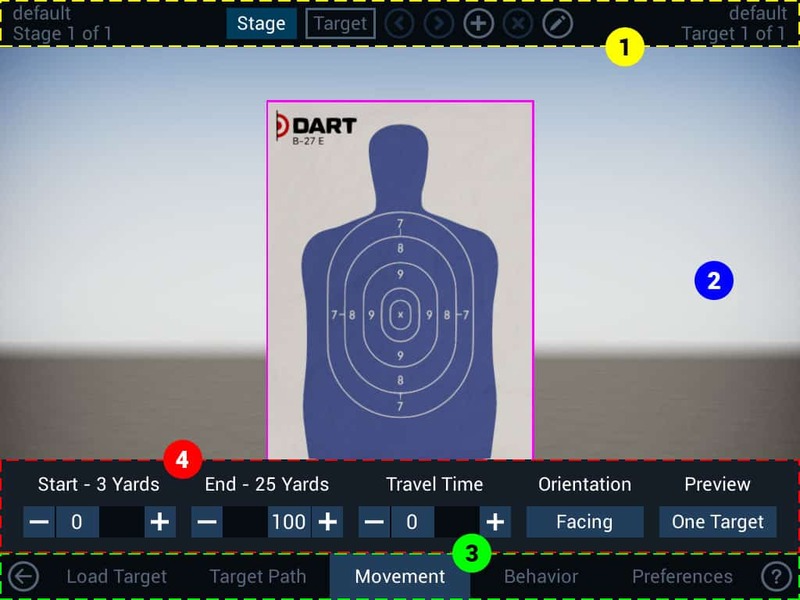 The DART Studio screen (sometimes referred to as the user interface or UI) is divided into four sections: the navigation bar, main display, menu bar, and command panel. The navigation bar at the top of the screen displays the name of the course and stage number on the left side, and the name of the selected target and target number on the right. In the center of the navigation bar are buttons for selecting between stages and targets and icons for moving between stages/targets, adding and deleting stages/targets, and editing stage order. When the Stage button is selected, the icons will move between, add, delete, and edit stages. When the Target button is selected, the same icons will move between, add, delete, and edit targets. Many menu selections, such as Rules have multiple options. These options are shown in command panels which appear above the menu bar.